I love this Pear Brown Sugar Caramel Syrup. It’s not only super simple, but it also’s super fast and gotta say it, good things come in three’s, right? It’s super delish. Best of all, it’s versatile enough to use not only on just about any breakfast item that needs syrup but on all kinds of dessert items, too. Pears just scream “fall” don’t they? But a pear waits for no man (or woman!) Pears just sit there and sit there on the counter doing nothing, hard as rocks, and then you turn around and they’ve decided to ripen and need to be used asap. That’s what gave me the inspiration to make Pear Brown Sugar Caramel Syrup. That and an absolutely EPIC (yes, I shouted it out in all caps) Pear Almond Granola French Toast, made with my Autumn Almond Pear Granola. Yeah, I thought you might catch that pear theme going on! See, I knew I wanted to make that granola, which I did, and then I got inspired to make the Epic Pear Almond Granola French Toast when I saw something like it on tv. I wanted to bring that pear flavor forward (and use my ripened pears) with this lovely Pear Brown Sugar Caramel Syrup. But whether or not you make the recipes I’ve chosen (and I hope you do – they’re so good, both the Autumn Almond Pear Granola and that French toast, photo below, recipe coming up tomorrow) I hope you’ll give this Pear Brown Sugar Caramel Syrup a try. It’s such a nice change up from regular old Maple Syrup and can be used in so many ways. I put some over a little ice-cream and I can’t wait to try some with my Grandma’s Gingerbread this winter. I can think of all kinds of things to serve with this syrup. And it could be made with apples, too, instead of pears. This is an easy, peasy, and you can’t go wrong kind of recipe. You can make a little or a lot, just use more or less of the ingredients. It’s really kind of a “ratio” kind of thing and can be multiplied out very easily. Toss a little butter in a pan, add in thickly sliced pears because thin slices will break up and practically dissolve (or as I said before, apples work, too) and saute them for just a minute to slightly soften them. Toss in some brown sugar and when that gets melty, add some water. It will look scary for just a minute because that water is going to harden up the sugar, but be patient and stir it around and it turns from a strange mass into a lovely syrup. Then just simmer for a bit until the fruit is softened and the syrup slightly reduced (it will thicken a little bit more when it cools a bit) and that’s it. If you decide you’d like your syrup thicker and the pears are already soft, they can be removed to a bowl and the syrup can be simmered to reduced more. Spoon your pears around whatever you are serving this with and pour the syrup over. This literally is like a 10-minute thing to do. It’s one of those it’s so easy it’s scary recipes. Scary because you might be sitting around watching tv and get it in your head to make this and serve it over ice-cream. And there goes your diet, right there! Because who can resist this! Ummn, not me, apparently! I started at some point, just making my brown sugar, and have a recipe on my site, but any brown sugar, light or dark will for this recipe. The Homemade Brown Sugar is cheaper and super simple if you’d like to give it a go. If you have brown sugar that’s hardened, it can be softened easily by adding a slice or two of bread or a couple apple slices and letting it sit in a sealed bag overnight. You can also add it to a bowl and cover with a damp paper towel and microwave it for a few seconds, maybe twenty or so, then check and add a few more seconds if necessary. Pears are available almost all year around where I live in Minnesota, but the best and the largest variety of pears are in the fall. This recipe works well with almost any pear. The common Bartlett like I used get soft and fuzzy and melty. Some of the other, firmer varieties stay more distinct. Either works well and tastes delish. Pears have the advantage of being cheapest in the fall, too. Buy them on sale and handle them very gently. Even when they’re firm, they will bruise and those bruises won’t be apparent until the pear ripens. Sometimes overzealous checkers manhandle the pears! Don’t be afraid to speak up if you see that happen. It’s ok to give a quick, polite “Hey, treat those gently, please.” A lot of newer or younger checkers just don’t know. Add butter to a saucepan or skillet over medium heat. Add pears and allow to soften, turning once. Sprinkle with brown sugar and once the sugar starts to melt, turn pears now and then. Add the water, standing back, it will sputter and spurt. Stir until the hardened sugar dissolves and mixture simmers. 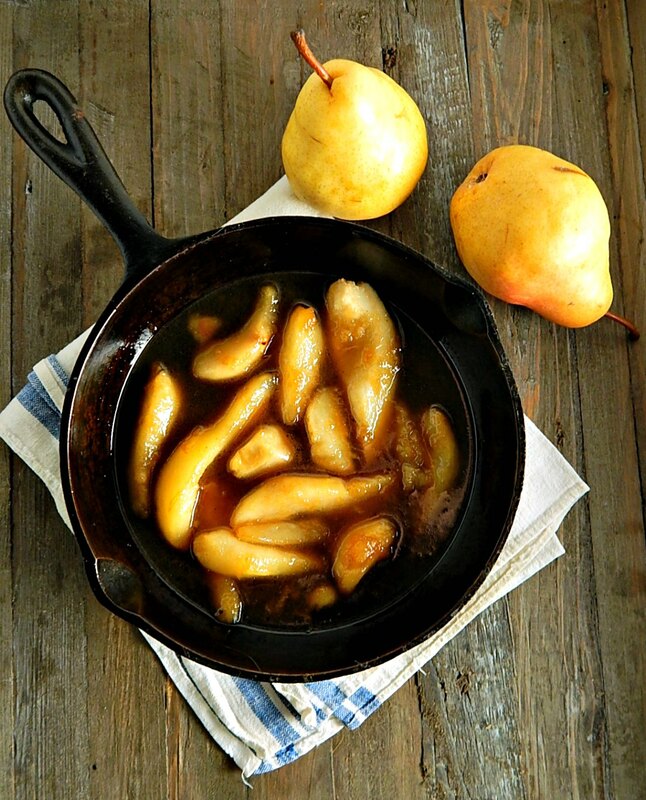 Continue to simmer, and when pears have reached the desired tenderness, remove with a slotted spoon. Continue to simmer until syrup is reduced to about a cup and 1/4. Syrup will thicken a bit more when it’s removed from the heat and cools a bit and when refrigerated, will thicken up even more. How much water to add and how thick the syrup should be are subjective. If the mixture seems to thin, simmer longer. If upon cooling, it becomes too thick, gently heat back up and it will thin out again. I’ll be sharing Pear Brown Sugar Caramel Syrup at Fiesta Friday #242, cohosted this week by Jhuls @ The Not So Creative Cook and Jen @ Apply To Face Blog. You’re going to love all the bloggers that share their best recipes of the week at Fiesta Friday but do drop by and see Jhuls & Jen. You’re going to love Jhul’s creative recipes and Jen is going to have you in stitches with a helping of her real-life stories along with each recipe. This entry was posted in Click here for Fabulous Food Posts and tagged Breakfast or Brunch Dish, Dessert Sauces, Desserts, Fruit Desserts, Pear, syrup. Bookmark the permalink. Thanks Sophie! It’s so good I could eat it with a spoon, lol!